Filson Weatherproof Original Briefcase. Filson's legendary briefcase, now made entirely with vegetable-tanned, weatherproof leather, combined functionality with durability. It has a large interior compartment with Rugged Twill and dry finish Tin Cloth pockets for organization. The adjustable, removable English Bridle Leather shoulder strap has a 5mm-felt-lined pad with pinked edging to prevent slippage. 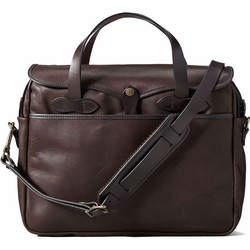 All hardware on this bag is solid brass, and both the exterior and interior are trimmed with English Bridle Leather. Despite this increase in quality and the use of leather throughout, the total weight of this briefcase is comparable to Filson's Original Briefcase in Rugged Twill.